This article is adapted from the article of the same title in Fermilab News on 31 October 2017. In parallel with the high-level science and technology agreement recently signed with the United Kingdom that supports participation by that country in LBNF/DUNE, Fermilab and the Department of Energy’s Office of Science have been working with international partners to develop and execute agreements that pave the way towards greater scientific collaboration. The agreements range from the exchange of personnel to the joint design and delivery of components for accelerators and detectors. 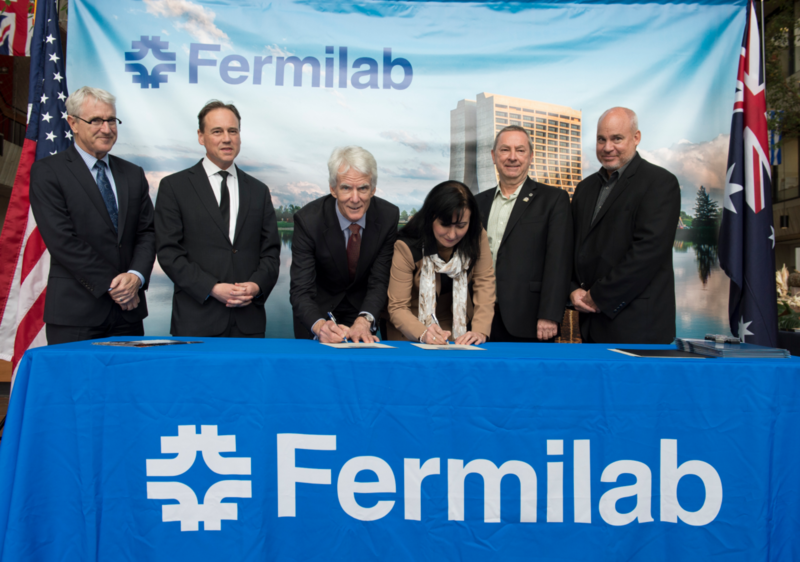 In October 2016, Fermilab signed an agreement with the Australian Research Council’s Centre of Excellence in Particle Physics at the Terascale, a consortium of four universities. Since then, agreements that establish joint interest and activities in particle physics research have been signed by Fermilab with additional institutions including the Federal University of ABC in Brazil, the Johannes Gutenberg University of Mainz in Germany, the National Autonomous University of Mexico and the University of Colima in Mexico. A student exchange program was also established with the Instituto de Fisica Corpuscular in Spain. And the pace of the development of new partnerships continues to increase. Two agreements were recently signed in the same week: The first on Oct. 17 between Fermilab and Canada’s York University establishing a joint faculty position; and the second on Oct. 19 with France’s Institute for Nuclear and Particle Physics, part of the country’s National Center for Scientific Research. As construction continues for the laboratory’s Short-Baseline Neutrino program and ramps up for LBNF/DUNE, keep an eye on Fermilab’s website and Twitter feed for news of even more international agreements toward joint research in neutrino science.